The world’s tiniest professional hair trimmer. 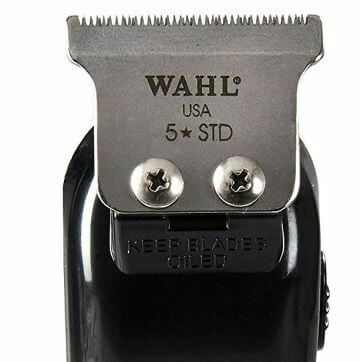 That’s how I would introduce the Wahl 5 star Hero trimmer. It’s not a marketing gimmick. A mere 4.25″, this neat machine caters directly to people who want something maneuverable, compact and easy to setup. It’s also perfect as an at home use hair trimmer. In this Wahl Hero review you’ll learn the most important things about it. I’ll also compare it to other popular trimmers so you can decide what suits your needs best. 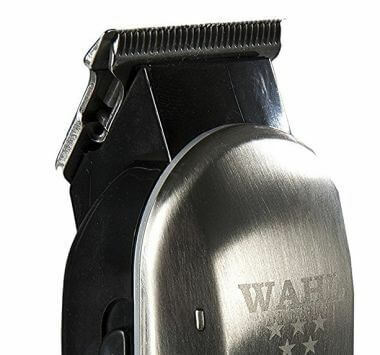 As I already mentioned, Wahl heroes are remarkably compact at 4.25″ and 4.6oz. This is way less than your usual pro trimmers that sport 5″+ bodies and weigh close to twice as much. What are the benefits of it being so small? For one, it is very maneuverable. 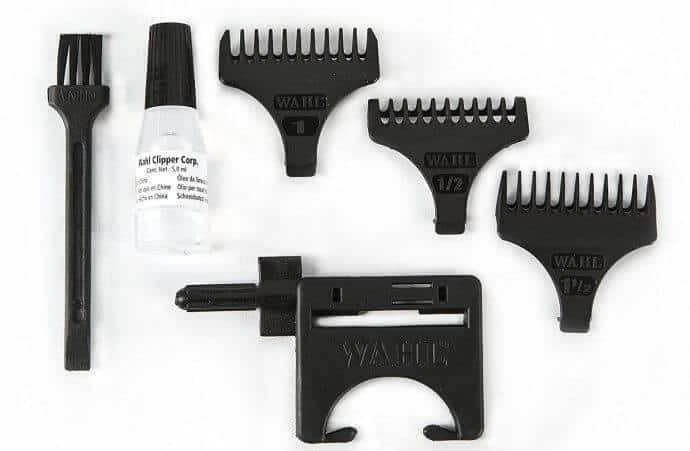 If you are looking to cut your kid’s hair or work in a shop with a lot of kids, then it is much easier to cut their hair with smaller clippers like these. In trimmers like the Detailer or cordless clippers like the Magic Clip, Wahl always stick to a burgundy/white color mix. The Hero t-blade trimmer features more mundane and clean looks. It preserves a sense of stylishness nevertheless. As accessories, you’ll receive 3 T-blade guards (1/16″ to 3/16″), a red blade guard, clipper oil and a cleaning brush. The big news is that you’ll also get a dedicated tool for performing blade zero gaps. The machine runs on 120V/60HZ. With that tool, getting these set up for doing skin fades is easier than ever.Though you don’t want to use these like clippers to do a full fade, it is helpful to get down to the skin with these trimmers on the bottom of the cut to then fade up with some clippers. You wouldn’t expect such a compact trimmer to sport a powerful rotary motor. Yet this is exactly what happens with this model. The Heroes use exactly the same motor as the higher priced Detailer, however they manage to run cooler. This is one of the best features of these trimmers. The Hero runs remarkably cooler than other Wahl trimmers and absolutely beats Andis electromagnetic motor trimmers by a long shot. How they manage to stay cool compared to other similar sized motor trimmers is a mystery to me, but I hope they end up using the same system for their other models to run cooler, too. The adjustable 1062-600 T-blade is standard-sized. It will serve you well for all standard trimming purposes, including edging and some lineups. This is the same blade the Professional Detailer from Amazon.com has, actually. A key to additional potential is the zero gapping tool you’ll receive with the Hero trimmers. You can bring the blade closer to unlock sharper trims. The difference here is that you needn’t experiment by yourself: Wahl give you the proper tool to achieve a close-cutting blade. You still have to be careful when you 0 gap these. They can still break the skin even when you use the tool to set it up if you’re not careful. And don’t use much pressure at all to avoid razor burn. This is especially important on the back of the neck as it seems to be the most sensitive area. I need to be honest in my Wahl Hero Review and with that being said, there’s no perfect trimmer. It’s always about the specific needs you have. Given its compact body and standard-sized T blade, the 5 star Hero trimmer is great for smaller areas. Think about goatees, mustaches, ears, some fine edging touches too. It’s simple. The smaller the surface you want to trim, the better this model will suit you. The 5 star Hero blade is narrower than the blade you’ll find with the 5 star Detailer trimmer. The “T” shape is helpful, though. You can get into the ears somewhat and do detail work on the beard if you want. Even though it is a narrow blade. In some circumstances, the narrow width could even be helpful. If you need to do some detailed edging, then you want that narrow profile to make sure you aren’t trimming an area that you don’t want to be trimmed. If you want to go for necklines or some assistance to fading clippers, you’ll do better with the 5 star Detailer or a GTX T-Outliner. Similarly, an Oster T-Finisher will yield better results for hairlines. The Heroes rely on their maneuverability. With smaller areas, it’s a blessing. If you need to trim bigger areas, though, their tiny body might be more of a nuisance. Price-wise, the Hero T blade trimmer WA8991 is cheaper than most other barber trimmers. While this model is crazy convenient, it’s also somewhat fragile. Be careful how you treat both it and its guards. It’s not as sturdy as a T-Finisher or a T-Outliner. Something I’d like to point out is the blade – especially when zero gapped, it can get quite sharp. This is a similar issue to the Detailer blade, actually. Keep an eye on it and don’t apply too much pressure when trimming to minimize the risks of skin irritation. Lastly, while the 5 star Hero will remain cooler than other models like the GTX T-Outliner, noise levels can still remain high. However, there’s a catch: this happens mainly when you put the guards on. I’ve encountered this with my Wahl Super Taper clipper too. Seems like the plastic guards amplify the otherwise normal sound. All said and done, the Wahl 5 star Hero trimmer is your top pick for smaller surfaces as what this Wahl Hero Review suggests . If you want something lightweight, very maneuverable and easy to setup, you’ll love this tiny fellow. While not as versatile as other barber trimmers, the Hero packs quite a punch beneath its clean design. Not to mention a price that’s quite more lucrative than other contestants. Ready to design the perfect goatee or take care of some edging work? The 4.25″ Heroes are waiting for you to pick them up! And lastly, don’t forget to share this Wahl Hero Review with someone you think who needs it! In regards to the “5 ☆ Wahl Hero, I was so pleased to receive it that when it wouldn’t work I was more dissapointed than if I hadn’t heard all the good reviews. Please help, I plugged the 2 pin cord into a plug then into a socket. it made a small sound as if it was switched on then nothing. Since then it has not been close to working but there was no impact on the plug or socket or any other appliance in the room at all. I need to know if I have damaged it or if was faulty.